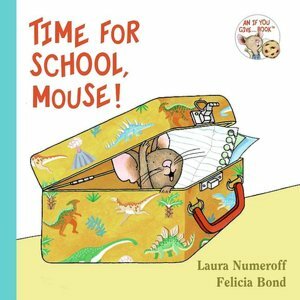 In this little board book, Mouse is getting ready for school, but he can't find his homework. My kids have each become obsessed with this book just before hitting age two! Though it doesn't follow the traditional "If you give a..." book type pattern, it does have a nice predictable storyline which is perfect for little ones just exploring language. At about 18 months, it seems that kids are really excited about saying words they know, and pointing out things they recognize, and repeating things they hear. I think that is why this book is such a hit. The simple illustrations are easy for little ones to recognize and it has a very clear problem and resolution, super easy to follow. Plus, after reading it a few times, it is so so cute to hear your little one join in and say all the things mouse finds instead of his homework. And of course, I love that it is board book! Durable, long lasting, good for chubby little hands! If you are racking your brain for a toddler gift this year, pick up this book. Are you looking mostly for holiday books and activities? Are you looking for favorites that would make good presents? Are you burnt out on too many holiday activities and looking for just plain old fun things to do with the kids? Let us know. Yes, I realize this will require that you comment-- it's not scary, I promise. It's super easy, you can even comment as a guest! E-A-S-Y! Really we'd love hear from you, even if you are just going to say, surprise me! - Happy reading and commenting?